The mission of the Louisiana State Bar Association Criminal Justice Committee shall be to recognize and address issues affecting the Louisiana criminal justice system, provide a forum for discussion, and work with stakeholders to develop programs and solutions for fair and effective administration of justice. LSBA’s House of Delegates adopted Resolution 8 opposing the court appointment of private attorneys to represent indigent clients. 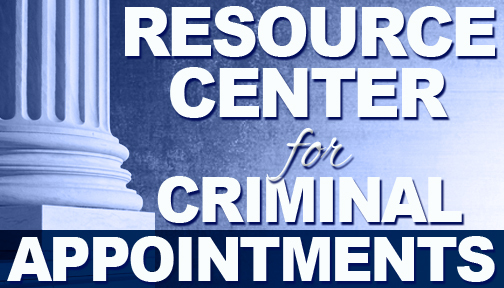 This section serves as a resource center for private attorneys appointed to represent an indigent client charged with a crime. The tools and information provided supports the position taken in Resolution 8. It includes a guide, motions and order templates, ethical obligations, relevant court decisions, and additional contacts. Objective information about Criminal Justice Administration, including statewide financial information, performance guidelines, and public defender and district attorney offices financial information by judicial district. The most current criminal justice news, events, and CLE’s can be found under this section, including the yearly criminal justice summit.